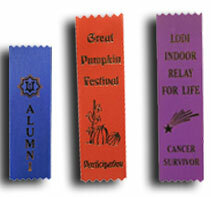 Scroll Down to see all our ribbons, they are in this order. Rosettes with Three Streamers, Rosettes With Two Streamers, Rosettes with Single Streamer, Card and String Flat Ribbons, Bookmark Ribbons with Pinked Top and Bottom. All Ribbons and Rosette on this page may be custom printed.